Back to school shoes: Softstar review and giveaway! September has seen us settling back into the school year routine. We are often asked to recommend a quality indoor shoe that is appropriate for the Montessori environment. Ever since Quentin started Montessori school, our recommendation has always been Softstar Shoes. You can see him wearing his first pair here and here. So when Softstar contacted us with a gifted pair for both Quentin and I we jumped at the chance. We love these shoes for so many reasons but the most important reason is that they support the natural development and strength of feet. Feet, especially those of little children were not meant to be in a hard and un-flexing soled shoe all day. They need to move, to breath and the toes need to be able to grip the floor. 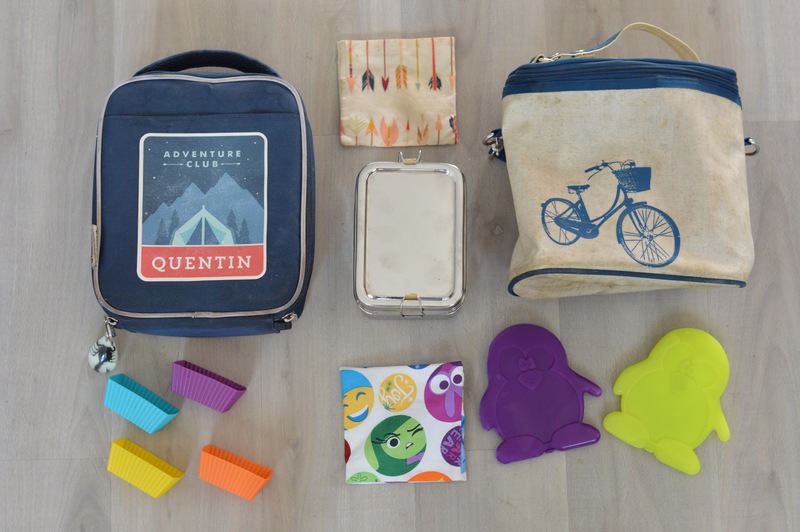 Quentin loves that they are completely customizable from the design colours to the materials. Quentin choose all black (perfect for schools requiring a black uniform shoe) with the rocket button in whiskey orange and gold in Sublime leather. Mine are a gorgeously soft Pebble Grey in Nubuck leather and I let the Elves choose the button motif which ended up being a star in Indigo. A perfect choice for an understated classroom look that goes with everything. They are absolutely perfect for someone who is on their feet all day in a bustling Montessori classroom. Roo Moccasins are lined with cosy sheepskin and so they are a pleasure to pull on in the morning and keep our feet odour free and breathing all day. They are also perfect for cosy play at home as the Autumn weather sets in. We love them so much that Softstar has graciously offered to give away pairs to one of our followers! Head to our Instagram feed here for your chance to win! It was a hard week. A combination of things that in hind sight could have been spaced more evenly to allow for Quentin to better process them. It began on the Saturday with his big brother leaving. Anthony took a position doing what he loves that will keep him away at least all summer. It’s happened before but Quentin was much younger. Perhaps the difficulty stemmed from the fact that he’s older now. Or perhaps it stemmed from the realization that this is a sort of practice run. That his big brother is now an adult and with high school finished will soon be moving on and moving out. 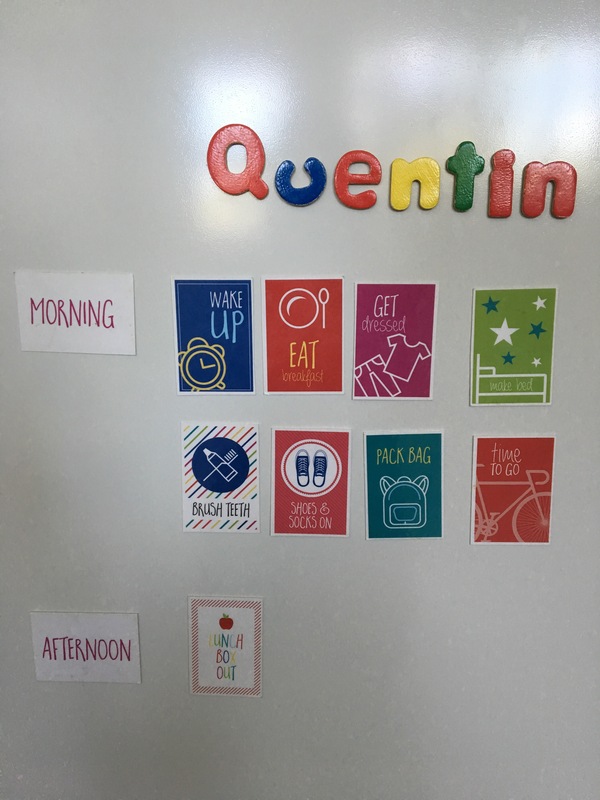 The very next day was Sunday and while Quentin left for his grandparents house to spend a week of too much media too many snack foods and late bedtimes, his parents left on a week long trip of their own. It was perhaps all too much to take on for one small boy but then the unimaginable happened. His beloved cat whom had gone missing 6 weeks before and we’d long since written off as dead returned. Emaciated and traumatized he was miraculously unharmed. We covered him with tears and kisses as we learned from his vet that the likely reason for his remarkable resurrection is that although he pried the back door open independently, after that someone stole him. The questions from Quentin immediately came. Needless to say it was a very long week. So. What do we do when our child’s rhythm and Sense of Order has been thrown so completely off course? What happens when a normally happy, peaceful, engaged child becomes rude, hyperactive and defiant? 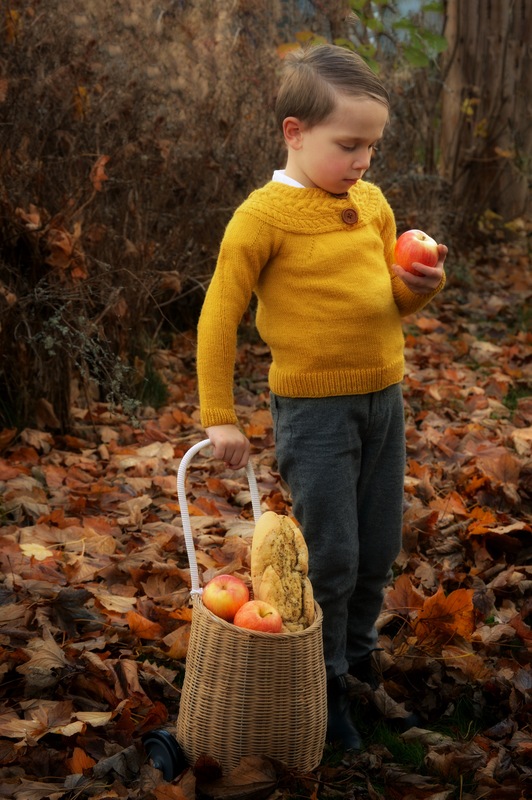 We take a breath, or two or three or more, and we go right back to Montessori basics. We start by acknowledging and empathizing with their feelings and offer our own perspective. Yes Huxley was taken which was horrible and I can see you are very sad and angry. I’m so thankful he was clever enough to escape and find his way back to us. And then most importantly we repair the Prepared Environment. For us this means predictable early bedtimes even though it’s summer holidays to ensure lost sleep is caught up. It means healthy food options at predictable times that the child can easily prepare, and access to lots of water to stay hydrated. For us it also means rotating in some special activities that we can do together as well as activities that the child can do quietly to regain their independent play moments. A container of water beads and a few sea creatures seen here is the perfect option to help extend independent quiet moments. 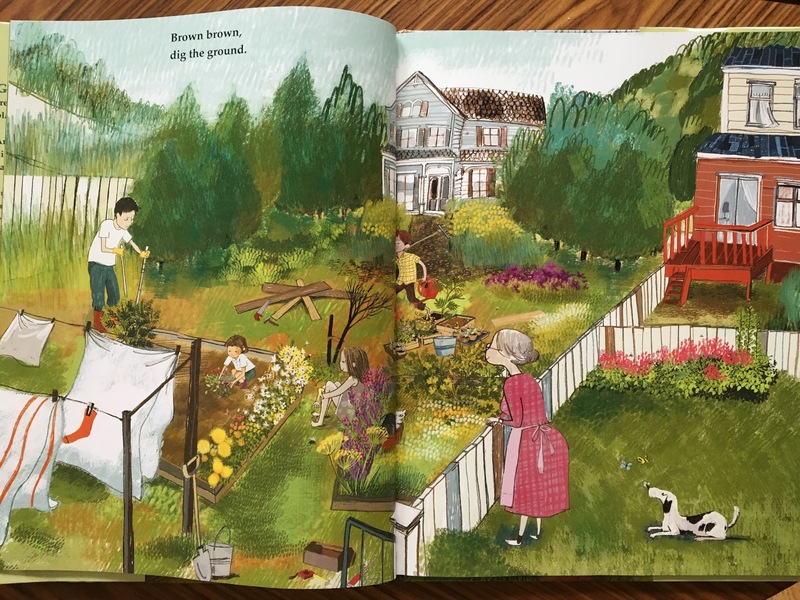 A new water colour pallet to ring in our yearly summer tradition of sitting under the maple tree in our front yard painting and reading goes a long way to help us reconnect with each other. Outings to the library or other regularly visited favourite places of the child can actually help a child get back into their home daily rhythm. And finally the most important aspect of repairing the environment is love. Extra words, extra gestures, extra closeness, extra time and extra patience. It’s knowing who your child is, knowing when something is off, and patiently and lovingly helping them through it. 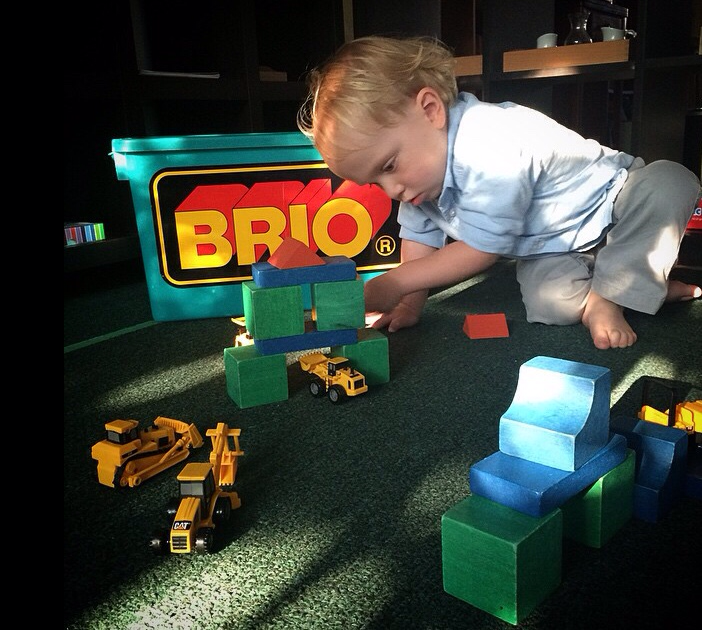 Ethically sourced, chemical free, Montessori compatible infant materials are often hard find. We love discovering local shops that have both quality and Montessori at the forefront of their design so when Anson the owner of CUBOS approached us to test their new shape sorter the CUBOS-lite, we were thrilled. Made from hardwood, finished in a natural beeswax polish, the pieces are stunning, easy to grasp and fit easily through their correct holes. The easy open lid will delight children as they can store more than just the accompanying blocks inside. The CUBOS-lite Kickstarter campaign opened yesterday and can be found here for anyone looking to purchase this beautiful Canadian made heirloom toy. We are so thrilled with it that we are giving one CUBOS-lite away starting today on our Instagram feed found here. Follow the link for your chance to win! Sewing is one of our favourite Practical Life activities to do in the 3-6 Prepared Environment. We love that this kit by KiwiCo is focused on the science behind rainbows and that it comes with everything your child needs to create some fantastic fibre arts projects! Like their “Tinker” subscription box for 9 years and up that we reviewed here, this Koala level is well laid out with easy instructions to follow. Kiwico is offering Our Montessori Life followers a free one month trial of any subscription box in their lineup! Follow this link to see their entire selection of subscription boxes and choose your free one! With Summer right around the corner in this part of the world, we’ve been planning lots of exciting outdoor time and some fun indoor activities to help keep us off screens as much as possible. I absolutely love subscription boxes and we have used many over the years but I have struggled to find Montessori compatible ones that were good quality, mixed age specific and above all tailored to a child’s general interests while being a “one stop shop”. So when KiwiCo approached us to review some of their subscription box options we jumped at the chance. KiwiCo is focused on STEM (Science, Technology, Engineering and Math) with hands-on projects delivered each month, and there are 5 different lines for kids up to 16 years. Although this particular box is ages 9+ Quentin can read at a 12 year old level. The words “walking robot” sucked him in right away and he immediately wanted to try this one first. I was sceptical I have to admit. Each box comes with everything you need including all parts, instructing and an accompanying zine. As you can see the instructions are extremely clear and easy to follow. At just turned 6 years old, Quentin could easily follow along. He liked that the parts lists were clearly laid out so that he could easily see what he needed to gather before reading the instructions and making the next step. I liked that many of the parts are actually wood, not something we often see in boxes like this. We were so thrilled with this set and we can’t wait to show you the others. KiwiCo is offering all Our Montessori Life followers a free one month trial of any subscription box in their line up! Follow this link to see the entire line of boxes and get your own! This will be perfect for those long summer days when we are in need of a little downtime together inside or under the big tree in the front yard with a glass of lemonade. There are so few books about implementing the Montessori pedagogy at home. 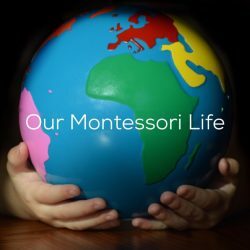 Maria Montessori’s own writings are textbooks intended for those in training and although they are a must read for anyone wishing to know more about this pedagogy as a whole, they are heavy reading and aren’t specifically tailored for a caregiver at home looking to change their way of living with their child. In February of this year all that changed with the launch of my dear friend Simone Davies’s book “The Montessori Toddler”. Who better to share their immense knowledge of the Montessori world than a AMI trained 0-3 Guide who has years of experience not only with her own children but with the toddlers of her beautiful school in Amsterdam. Each chapter of this book is thoughtfully laid out. The attention to detail is vast and every topic is covered in an easy to read and easy to implement format. At the back of the book there is comprehensive list of age appropriate authentic Montessori activities for toddlers. 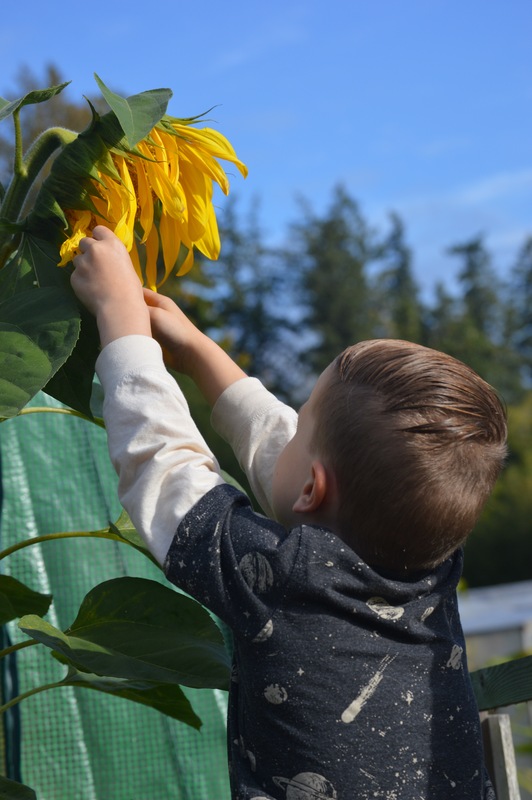 These activities are true to Montessori’s scientific knowledge of the Plane of Development for a child and give caregivers so many tools to aid their child’s natural development. Along with a chart of activities there are also gorgeous pictures of authentic Montessori homes from around the world. We were extremely honoured to be asked to be apart of this section of the book and our own pictures are featured next to some beautiful examples of what Montessori truly looks like in homes both big and small. Above all, this is the most important message of Montessori and it is displayed so beautifully here. That each child is unique with their own interests and talents and curiosity. We love this book so much that we are giving away a copy on our Instagram account found here! The contest is open internationally in hopes that everyone everywhere will have a chance to add this amazing resource to their collection! Autumn is such a busy time. A time of new beginnings, new classrooms, new friends. As it gets a little more crisp outside, we purposely try and step back and take a breath. This is not the time for extras here. So while others are shuffling off to new afternoon programming of teams and lessons we are snuggling down. Back to school, less daylight and colder mornings all make us treasure our downtime. School days are busy and filled with learning. Quentin will often ignore his Montessori home shelves at this time of year more than any other time. Instead we make extra effort to connect with each other. This includes long walks in the crisp air to the market. It does us all good to get out together. His basket (the Little Luggy by Olie and Ella) is a new addition. We searched and searched for a supplier in Canada. Finally I contacted Nineteen Ten in Vancouver. The staff was amazingly helpful. They offered to order one in for us, and then shipped it to our home. We are so thankful for all their help. It arrived quickly and Quentin has been smitten ever since. We love watching the seasons change and finding quiet activities to help each of us find calm and peacefulness. Long walks outside bundled up. If you are feeling like the approaching holiday craziness is getting a little too close, or the back to school madness is starting to take over, consider stepping back at home. Instead of restocking your Montessori shelves with new activities, stop and observe the child. This may not look like it, but this is one of the most important ways we teach Montessori Peace Education. By learning to slow down and be mindful of our bodies need for rest, we give the child the ability to self regulate. This is the first step in Peace Education. We ask ourselves are they wanting more to do on top of what they do at school each day? Or are they just wanting us? 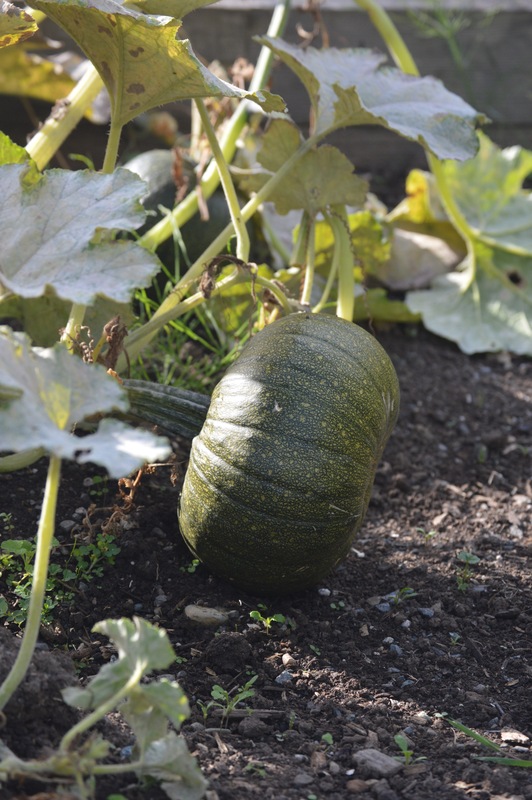 We spent this glorious Autumn day in our Community Garden. 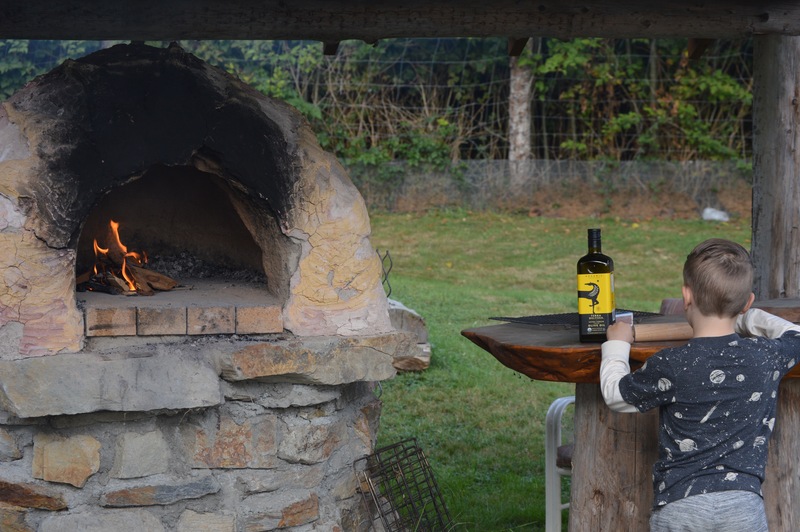 We met good friends, cooked pizza in the cob oven and sipped tea from the carafe. 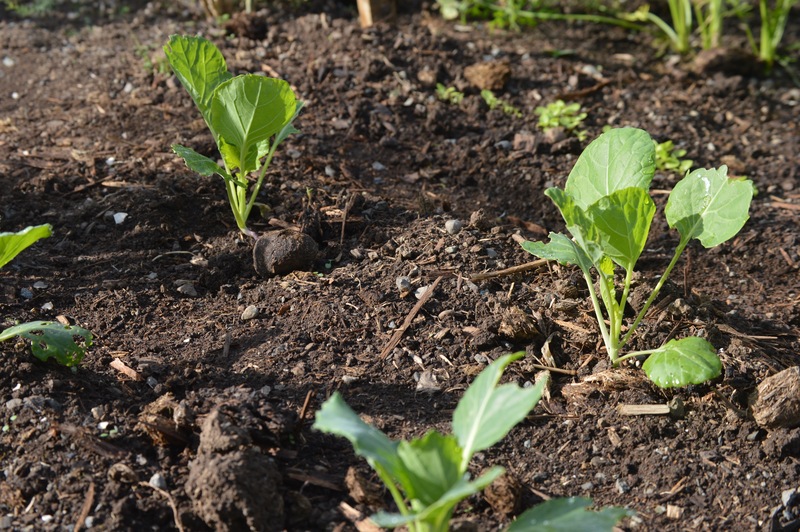 Our community garden changes so much with each season, and so it’s nice to slow down and really take in all that it provides for our family. It is a place we gather to grow food sure, but it’s much much more. It offers endless Practical Life and Sensorial explorations for a child. The sights, sounds, tastes, smells and textures are limitless. It offers our family not only a chance to grow affordable food, but also meet like minded people from our diverse small community. It’s a gathering place for the community and our children get to meet so many different people that they perhaps wouldn’t cross paths with during our day. Most importantly Quentin gets to run free. It is a big, secure area with so many things to take in and he gets complete free range here. Jumping from rocks, splashing in the creek, just having fun. This book is the perfect companion to veteran gardeners or also those just starting out. 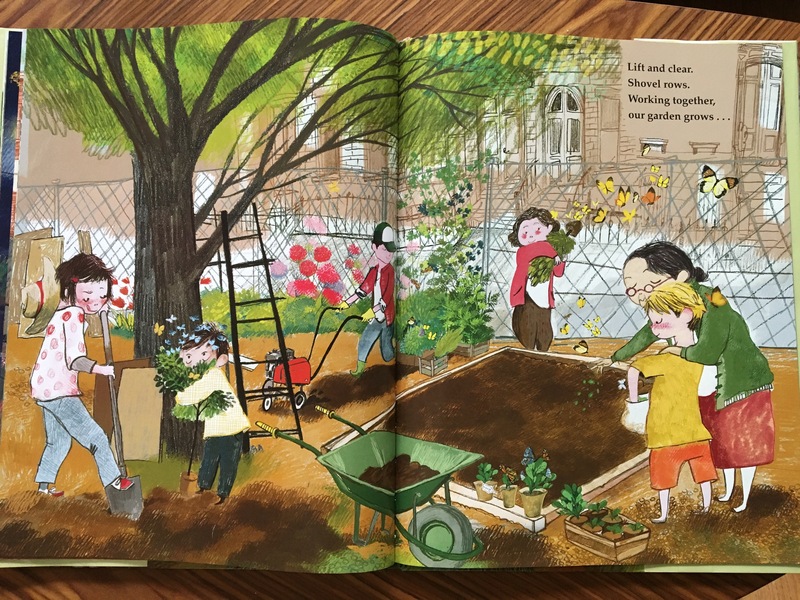 It is wonderfully diverse in its characters and tells a simple story of build a garden in an unexpected place in the city. It is accompanied by interesting facts and helpful tips for starting a little green space and attracting wildlife whether in an urban or rural area. 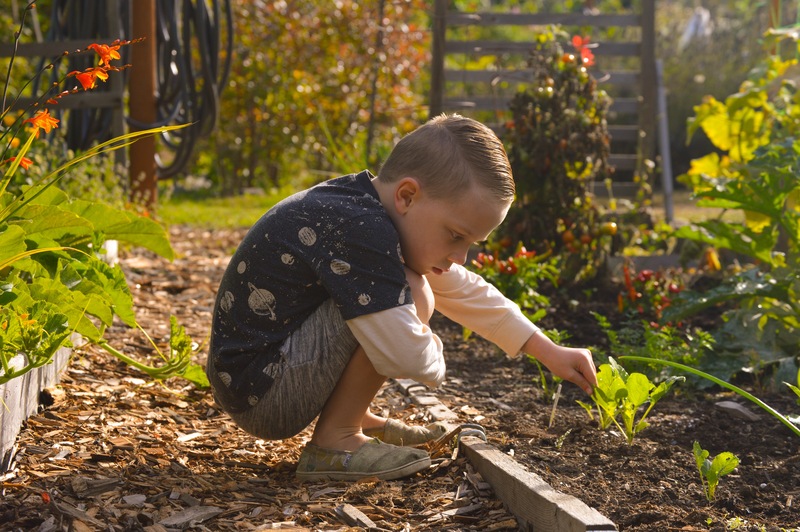 If a garden isn’t quite possible for you this year, why not check out a farmers market near you and show your child all the awe and wonder of growing things. The Summer days are counting down. At home we are well on our way to settling back into our school routines. As we spoke about earlier here, clear, consistent gentle rhythms will easy your child into the morning and nightly school routines. More importantly though, it will help prepare your child for the routines of their classroom. One of the easiest things to do is use routine cards. We love these free printable ones. They are not too childish, easily understood and large enough to be gripped by small hands. Laminated with a small dot magnet on the back and stuck on Quentin’s fridge, they have held up for years of daily use. He can easily see the order of his tasks and he has the ability to change the order should he choose. 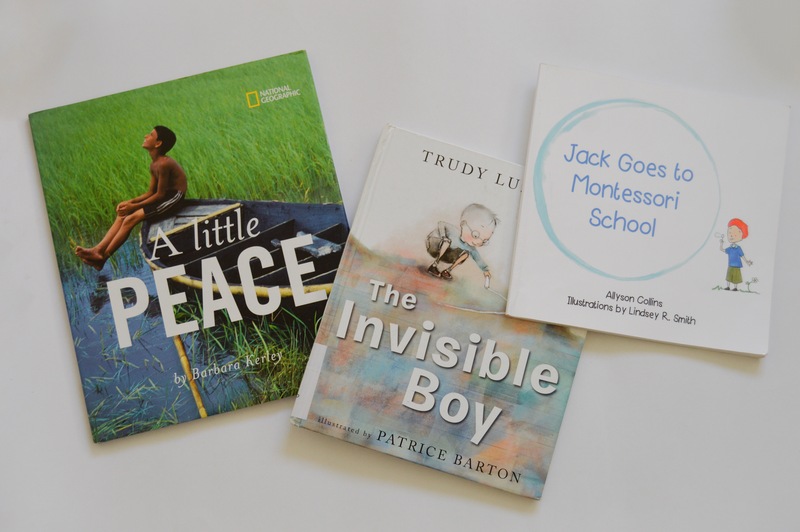 Books can help prepare kids for what to expect in the classroom as well. These are some of our absolute favourites and you can find out more about them here. The more routine you implement before your child goes off to school the better they will be prepared for their days. Don’t wait to until the first day of school to start getting up early. Start today. Figure out what time you need to get up to get everyone fed, clothed and out the door. Then set the alarm 15 minutes earlier than that! Get up even on the days you don’t need to. Even if it’s just a little bit earlier. It will help your young child keep that routine going. Get dressed every morning, even on holidays or weekends. Don’t wait till noon. This is a common mistake. Practice, practice practice your child’s self care tasks. Your child will need to know how to change their outdoor footwear, recognize their name, open their lunch containers, put on their jacket and use the bathroom completely independently. As a 3-6 Montessori teacher, I implore you to give them the confidence they need to get through their day without you by making sure they can do these task independently. Set a bedtime routine that is gentle, allows for lots of family closeness and above all calm. We like to make sure that Quentin has a bath with some lavender essential oils and a warm towel to dry off with Then afterwards we sit with a candle and an essential oils diffuser going before getting him into his bed and reading together. This entire process can sometimes take two hours. It means that we need to make the conscious decision that his needs must come before our own. It ensures that he is truly calm and feeling reconnected after his busy day away from us. Swimming lessons, sports and outings are very important but in the first weeks of school can create extra stress. Consider putting them on hold for the first month at least. Your excitement may not be shared by your child. Be prepared for anxiousness and crying. Keeping the same routine every day and reassuring your child you will come back and get them will help. Back to school is a big transformation for any family regardless of if it’s your first time or not. Instilling routines that help prepare your child for separation, independence and the rhythm of your day will go along way to decreasing anxiety for all those involved. Autumn has crept up on us. 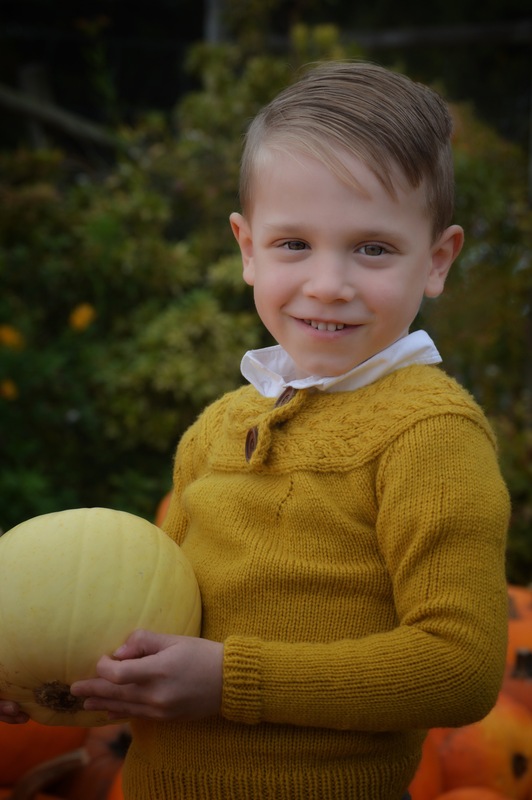 Many children have already returned to school and with our own first day less than two weeks away I thought I’d share our Montessori essentials for back to school. The benefit of being both a mother and a trained Montessori Guide is that I live in both the home and school environment. So I’ve compiled a list of Montessori back to school essentials both from a veteran parent and teacher perspective that I’ll come back to and do separate posts on in the upcoming days. Pick a time in the morning that everyone should be up by in order to get out the door on time. Then add 15 minutes and set the alarm for the adjusted time. Make sure your child is going to sleep at a time that will allow for them to wake up rested. 10pm Summer bedtimes DO NOT WORK for the school year. Don’t wait until the first day of school to start this. Start it ASAP, even if you aren’t going out the door today. It will take awhile for your child to adjust. Make setting out clothes the night before part of your child’s bedtime routine. Make sure they are clothes your child can use the bathroom independently in! Speaking as a teacher, overalls, skinny jeans and long dresses just don’t work for a young school child. I’ll get into more detail about routine in an upcoming post but those are the basics. Your child will need to open their own containers. Choose ones your child can open independently and help them practice in advance. Make sure you know your school’s food/nutrition policy. Many schools have zero junk/zero waste policies or allergy policies. If you are unsure about what to send contact you school or pack a variety of nutrition rich foods in reusable containers. I’ll get into what we pack and how we pack it later this week. This is an emotion filled time for any child. Some children are looking forward to it, some are more anxious. Some will have changing feelings in the upcoming weeks as they transition into their classrooms. Just like we spoke about here, give your child lots of space, love and encouragement. If being grilled by a loved one on all the activities you did at work today is annoying, don’t do it to your child. Instead ask them relatable questions such as “What does your playground have?”, or “What did you do that was fun today?”. Be prepared for your child not to be able to answer “Who did you play with?” “What did you do?” kinds of questions. Also be prepared for them to be exhausted. Show them how much you love and respect them by gently offering help if needed, and allow them time to just “be” when they get home. 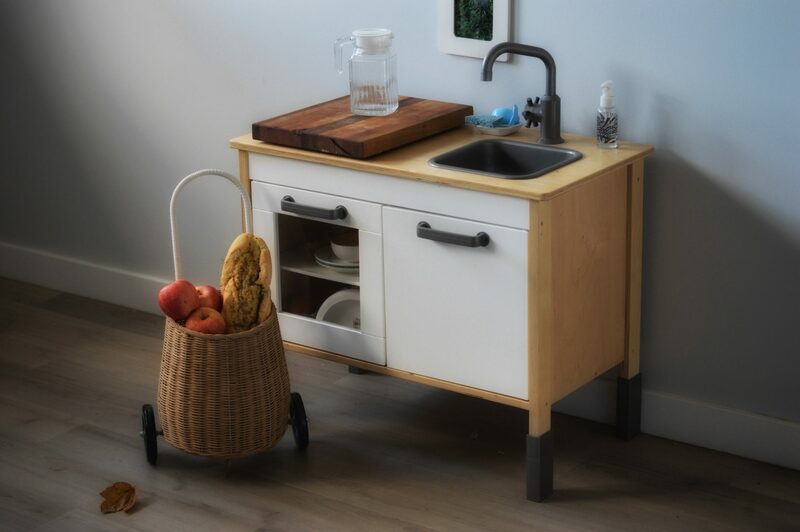 After school IS NOT THE TIME for getting out more Montessori trays off your home shelves. It’s time for reconnecting with a loved one, reestablishing trust and closeness and just relaxing.